A micropropagation system for ‘Yamatoimo’ Chinese yam (Dioscorea opposita Thunb.) was developed. Immature leaves collected from virus-free plants growing in the greenhouse were cultured on MS medium supplemented with 8.9 μM benzyladenine (BA), 3% (w/v) sucrose and 0.8% (w/v) agar. After 2–3 months, multiple buds that were clumps of green-colored bulbous structures including adventitious buds and meristematic regions 2–3 mm in diameter were formed on immature leaves. 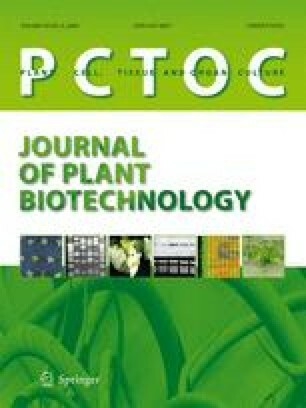 Transplanting clusters of multiple buds to fresh MS medium supplemented with 0.11 μM α-naphthaleneacetic acid (NAA), 0.89 μM BA and 6% (w/v) sucrose was effective for inducing shoot formation, leading to plantlet formation. After 6 months, a large number of microtubers, about 3–7 mm diameter, were obtained.